On the morning of December 21, the Review and Development Forum on the 120th Anniversary of Studying Abroad was inaugurated in Xi'an Jiaotong University. Celebrities and academicians attended the opening ceremony such as Sheng Jianxue, Secretary general of China Scholarship Council, President Wang Shuguo and vice President Xi Guang from Xi'an Jiaotong University, Sun Jianning, Deputy Inspector in Shaanxi Education Department, Kan Kaipei, Deputy Director of Shaanxi Foreign Affairs Office, Professor Li Tonggui from the school of psychology and cognitive sciences in Peking University and so on. The opening ceremony was presided over by He Changzhong, Director of International Cooperation & Exchanges in Xi'an Jiaotong University. 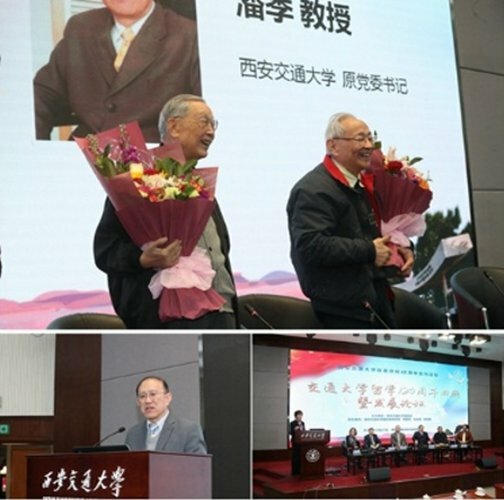 Shi Weixiang, Former President Pan Ji, Former Party Secretary, Guan Xiaohong ,Academician of Chinese Academy of Sciences, and alumni representatives from home and abroad were invited to attend the opening ceremony and shared a variety of study abroad experience.such as Principal Weixiang Shi who is a senior comrade from Westward Movement and formal principal in Xi'an Jiaotong University, Pan Ji, the former Party Secretary, Guan Xiaohong who is an academician of Chinese Academy of Sciences and the dean of the school of electronics and information engineer in Xi'an Jiaotong University, as well as Ma Haian, President of the British Alumni Association of Xi'an Jiaotong University and Liu Chuanli, President of the Michigan Alumni Association of the United States, Liu Haifeng, General Manager of Xi'an Vorp Power, Lu Lu, the former manager of National Additional Materials Manufacturing Innovation Center in Europe, Bilal Haidi Shanxi, International Student. Nowadays Xi'an Jiaotong University stands at the starting point of Chinese ancient silk road and plays a new leading role in the Belt and Road Initiative. 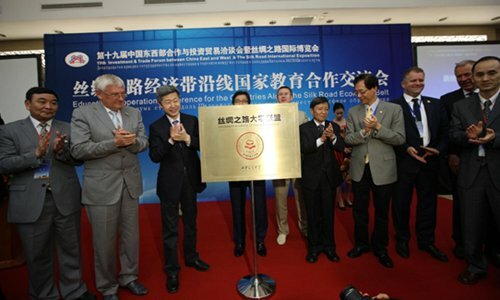 Xi'an Jiaotong University, launched and set up the University Alliance of the Silk Roadin 2015.Since then there are 151 colleges or universities from 38 countries and regions joined the alliance. Meanwhile based on this alliance framework, "" XJTU-POLIMI Consolidated School of Design,, "Silk Road International Institute of Technology", "International Knowledge Center for Engineering Science and Technology under auspice of UNESCO" " were developed successfully, other activities concerning silk road such as Silk Road Robotic Innovation Competation and Youth Leadership Program were grandly organized in succession. Recently, the Culture Heritage Roundtable was initiated to promotee the cooperation on cyber construction of the "cultural heritage". The international educational undertaking in Xi'an Jiaotong University started in the early 1950s which has a long history of 60 years. As an critical part of the campus internationalization, Xi'an Jiaotong University has always attached great importance to the education of foreigner students in China. Over the years, Xi'an Jiaotong University has made fruitful achievements in the educational field of overseas students. It is also one of the first universities to receive overseas students appointed by the former Ministry of Higher Education and Chinese Government Scholarship for these overseas students. In 1995, it originally initiated the All-English Teaching Program on medical science for foreigner students. At present, there are 16 international teaching programs in English, including science, engineering, medicine, management, economics and other disciplines. Through further innovation and reform, Xi'an Jiaotong University has formed a sound teaching and management system for overseas students. In 2013, Xi'an Jiaotong University was awarded the "National Demonstration Base for foreigners studying in China" by the Ministry of Education. Representatives from overseas returnees shared their overseas study experience with each other in this forum. They also encouraged these energetic students present to be earnest and down-to-earth and to devote themselves to learning, integrating individual growth and development with the destiny of the country and the nation, and to make great contributions to the journey of realizing the Chinese dream of the great rejuvenation of the Chinese nation.